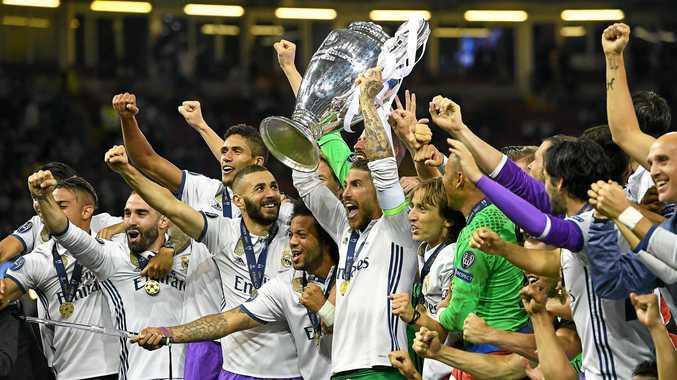 REAL Madrid is the first club to successfully defend the UEFA Champions League title after a 4-1 win over Juventus in a pulsating decider at the Millenium Stadium. The scoreline was harsh on the Italian outfit, which was locked at 1-1 with 30 minutes to play in an enthralling finale to the European club season that featured one of the great UCL goals from Mario Mandzukic. But Cristiano Ronaldo, who notched his 600th professional goal in club and international football, and his Real Madrid teammates confirmed themselves as Europe's No.1 powerhouse with this superb triumph. AC Milan's 1990 win, before the UCL era, was the last time a club has won European football's top prize is successive seasons. The match in Cardiff was played at a brilliant tempo, but with the game on the line, Los Blancos showed another gear and scored twice in three minutes on the hour mark - against a side that leaked just three goals in its European campaign this season - via defensive midfielder Casemeiro and Cristiano Ronaldo. It is the Spanish club's 12th Champions League/European Cup final win, capped by Marco Asensio, who added a fourth in the 90th minute. It was the seventh time Juventus had lost a decider at this level, with 39-year-old goalkeeper Gianluigi Buffon left to rue a third missed opportunity to claim the coveted trophy. Ronaldo put Los Blancos ahead in the 20th minute with a brilliant finish to cap a swift Real Madrid passing move from their own half, with Luka Modric, Toni Kroos and Karem Benzema all involved. Ronaldo fed Dani Carvajal, who then supplied the cross for the Portuguese to nail his 107th European goal - a superb finish for the La Liga champions to take the lead against the run of play after a bright start from Juventus, which saw Miralem Pjanic and Gonzalo Higuain both sting the palms for Real keeper Keylor Navas. The Italians' response was impressive, and they equalised just seven minutes later after Mario Mandzukic took everyone's breath away with an athletic scissor kick from the edge of the box. It capped a fine interchange of one-touch passing, starting with Alex Sandro on the left byline collecting a Leonardo Bonucci diagonal pass, before pin-balling it on the run to Gonzalo Higuain in the middle. Buoyed by the goal, Juventus had Zinedine Zidane's side on the back-foot once again towards the end of the first-half; it was entertaining and fascinating, with both sides dominating for periods. In the second-half, Real regained the lead after Brazilian central midfielder Casemeiro tried his luck from distance and was rewarded - with a deflection off Sami Khedira squeezing his shot past Buffon. Just three minutes later, the imperious Luka Modric picked Ronaldo out to open up a two-goal advantage, as the Portuguese scored his fourth goal in European club finals - more than any other player. With the game winding down towards an inevitable Real triumph, Juve substitute Juan Cuadrado picked up two yellow cards, the second coming in controversial circumstances as Real skipper Sergio Ramos tumbled to the turf after light contact. But that will become a footnote on a night he was able to hoist Real Madrid's 12th trophy on this stage, marking a remarkable start to Zizou's managerial career. "If you had told me that I would have won all of this as a coach, I wouldn't have believed it," Zidane said. "I'm happy, I'm incredibly satisfied." "We are disappointed," goalkeeper Buffon said in comments published on the website of European governing body UEFA. "We played very well in the first half. We thought we had enough to win the game. I cannot explain why we played like we did in the second half. "Real Madrid deserved to win in the second half. They showed their class and the attitude needed to play in this kind of game." Isco was selected ahead of Gareth Bale, but the Welshman got a late cameo in front of his home faithful. "We have made history. We'll enjoy this moment now. We needed confidence at half-time and we had to take our chances, which we did," he said. The 27-year-old added: "What an incredible scene. The city has done an immaculate job in hosting a great event. "To win this at home is a great feeling. It's been a hard season. "I've worked tirelessly to get fit and these are your rewards. I was happy to get on." French forward Karim Benzema said: "It's amazing, to win one, then two, then three. "We've made history and, there you go, we're the best team in the world - it's fantastic. "I want to keep going like that and win lots of trophies. We live football for this and tonight we're all delighted."